It ended in a brutal declaration of superiority from the All-Ireland champions, not at their best last night but still capable of putting together 5-18 against an Offaly team that emptied itself and tried to do everything right. In injury time, with the result beyond doubt, Jason Flynn, mere moments on the field and in a hurry to leave an impression, stormed past fading Offaly cover and slammed home a fifth goal. Offaly were not beaten off the field but they still ended up with a considerable final deficit, one that matched the handicap forecast, even though they were well in the contest for the first half and still clinging on for the early part of the second and making a game of it. But they know it could have been worse too. Joe Canning missed a penalty in the 11th minute, hit at a favourable height to Eoghan Cahill's left. Immediately before, Conor Whelan should have goaled but tried to be too pinpoint and the ball came back off the upright with Offaly stranded. In the second half, Cahill made three fine saves to deny Galway goals, two from Joe Canning and one from Conor Cooney, and Cahill had so much to do, even scoring a free, that it told a tale of clear Galway dominance. Last year they won the All-Ireland blitzing teams with points, and went through the entire campaign scoring just two goals. They will meet tougher resistance than this but five goals is more than twice last year's entire haul in one evening. Canning hadn't a big performance, yet Galway still had plenty of shooters to hurt Offaly, who defended heroically at times, none more so than the corner back, Ben Conneely. They also outshone Galway's midfield in the first half, with captain David King and Shane Kinsella not looking over-awed, although David Burke came into the match strongly after the interval. Galway's Brian Concannon, an All-Ireland minor winner in 2015, took little time to adjust to his new surroundings with a sparkling debut. He finished the night with 2-1, looking nimble and opportunistic, the first goal in the fifth minute coming after he latched on to a rebound from a fierce shot by Conor Cooney that bounced off a post. His second goal, set up by Conor Whelan ten minutes into the second half, Galway's third, opened a 3-11 to 1-8 lead and from there they never appeared seriously inconvenienced. 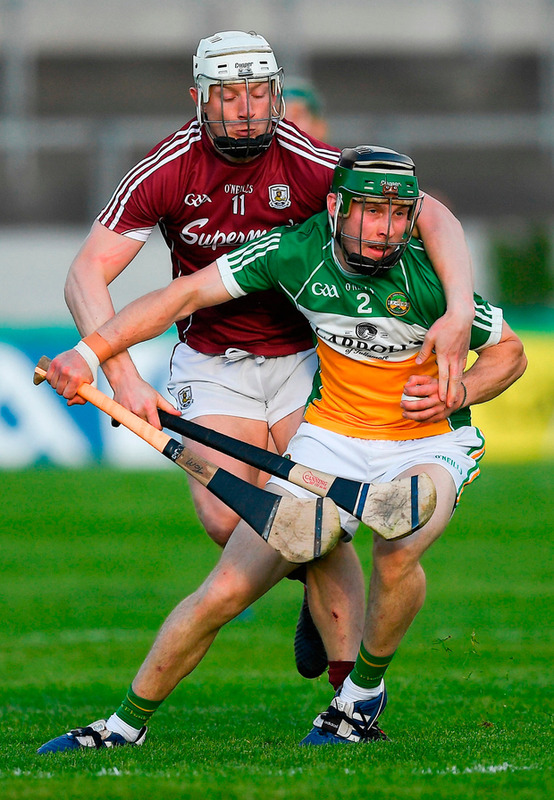 Joe Bergin pulled on a breaking ball that brought a second Offaly goal a couple of minutes later, but Galway put daylight between the teams with a fourth goal, from Whelan, on the hour and then landed the last blow ten minutes after from Flynn. Offaly by then looked tired and their attack had run out of ideas, lacking the pace, if not the effort, needed to cause Galway problems. Offaly's reliance on Shane Dooley was evident in his 1-9 haul, all but 1-1 coming from placed balls. His goal breathed fire into the Offaly challenge in the first half, coming within a minute of Canning's penalty miss. Had the penalty been converted Galway would have led by seven points. Instead, the ball went downfield and Oisin Kelly set up Dooley for a morale-boosting goal and the lead was down to a point. 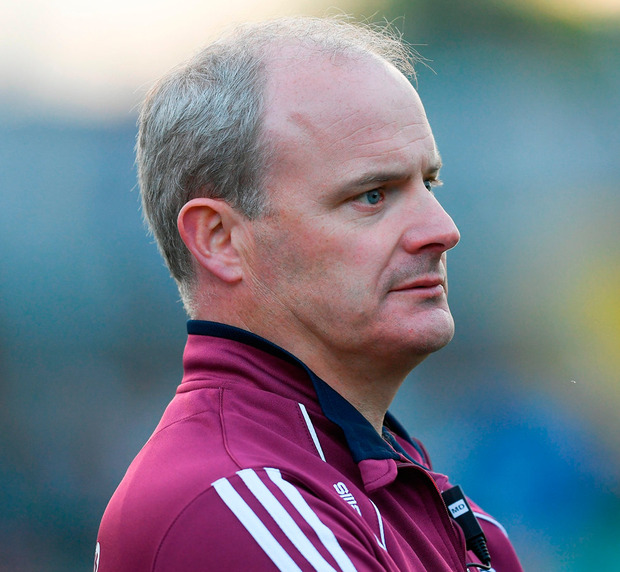 Galway, who hadn't hurled competitively since losing to Wexford seven weeks ago in the National League quarter-finals, finished the first half strongly with a goal from Joe Cooney, set up by Whelan, and a Cathal Mannion point, both scores in injury time, opening up a 2-9 to 1-7 interval lead. Cooney picked off four excellent first half points to go with his goal. 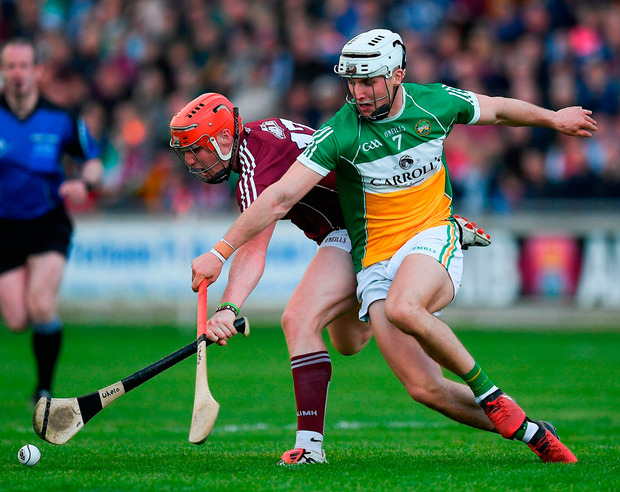 Offaly need to pick themselves up quickly for a trip to Nowlan Park against Kilkenny next Sunday, while Galway have a break, before facing Kilkenny in Salthill in a fortnight. Under Kevin Martin Offaly have abandoned the double sweeper system that many in the county deeply disdained, the more orthodox formation applauded as a brave first step to rehabilitation. But they have still some way to go. They played with a forward line last night that had the height to compete physically with Galway but the unit lacked the pace to really hurt them. As the game went on Galway got to grips with the best they had to offer and were comfortably in charge, with the exception of Bergin's goal which came from a route one delivery. Offaly's challenge is to keep their bodies and spirits intact until they face Dublin in what may be the crucial match in terms of deciding who is demoted to the McDonagh Cup in 2019. They did themselves no favours with some loose shooting, notably in the first half when they had nine wides to Galway's four, a carelessness they were bound to pay a price for. In the first half King, a midfielder, was their only scorer outside of Dooley. 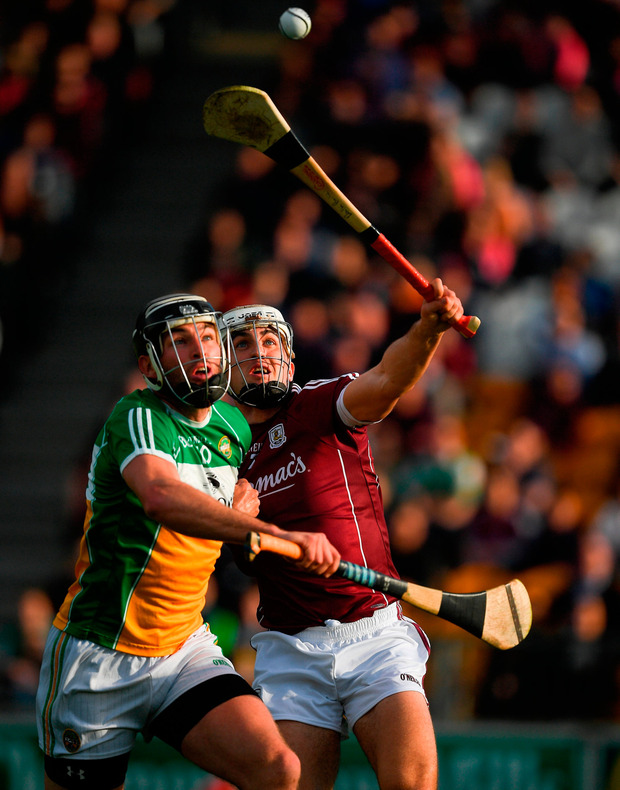 After the interval, hopes of a first Offaly summer win over Galway in 24 years looked increasingly remote and the match gradually drained itself of any suspense. It ended up being a harsh lesson for the hosts, perhaps unfairly so, but Galway are off the blocks and will be expected to get better as time goes on. Scorers - Galway: J Canning 0-8 (6fs, 1 65); J Cooney 1-4; B Concannon 2-1; C Whelan 1-1; J Flynn 1-0, C Cooney 0-2, C Mannion, S Loftus 0-1. Offaly: S Dooley 1-9 (0-8fs); J Bergin 1-1; D King 0-2; D Currams, E Cahill (f), S Kinsella 0-1. Galway: J Skehill; A Tuohey, D Burke, J Hanbury; P Mannion, G McInerney, A Harte; J Coen, D Burke; J Canning, C Mannion, J Cooney; C Whelan, C Cooney, B Concannon. Subs: S Loftus for J Coen & J Flynn for C Cooney (58); N Burke for C Mannion (63); R Burke for Harte (65); J Glynn for Canning (66). Offaly: E Cahill; T Spain, S Gardiner, B Conneely; D Egan, P Camon, B Murphy; D King, S Kinsella; C Mahon, D Currams, C Egan; O Kelly, J Bergin, S Dooley. Subs: C Kiely for Mahon (52); S Ryan for Murphy (58); P Murphy for C Egan (61); T Geraghty for Currams (62); P Rigney for Spain (67).